If you have a clear idea of what you need, you will be more likely to find a company that matches your requirements. For example, you might have confidential files and need additional security, or you may have items such as painting or works of art that will need extra care. Also, you underestimate how much you have to move, you could end up hiring a company which doesn’t have the capacity you require. Make the most of all the information you can find online. This will give you an idea of what is available in your area and tell you what services they offer. But don’t just look at what the company has to say about itself. Check out reviews so that you can find out which ones offer first class customer service. Some of the better companies have Removals Calculators where you can calculate the volume of your move from office furniture to golf clubs. Once you narrow it down to perhaps three possibilities, ask them to give you a quote. If the quotes are significantly different from each other feel free to ask more questions. The most expensive quote might be best – or may be overcharging. But on the other hand, the cheapest company might be cutting corners to undercut the competition. Even if it is a small move involving fewer items than a typical house move, it is still best to go with a company used to doing office moves. The kind of items to be moved will be different and require different knowledge and experience in terms of both organisation and handling. Also, insurance to cover damage on a domestic move might not cover items used solely for business. Hopefully, you won’t have to put that to the test, but it is not worth taking any chances. 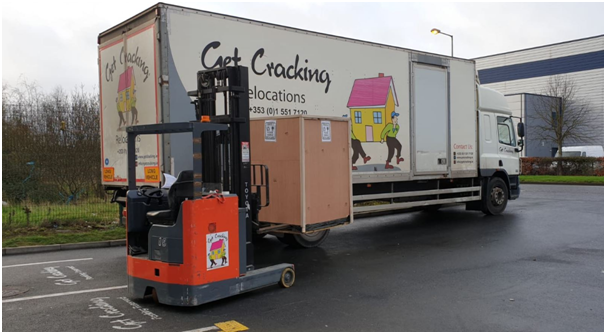 Removal companies who understand the needs of a commercial move will often offer additional services to make sure that everything goes smoothly as possible. They might be able to provide confidential waste and shredding services to help with the office clear-out which usually has to be done before a move. Some will offer assistance to dismantle desks and chair and other furniture, and also help to put them back together again at the other end. These services can often pay for themselves in terms of the number of business hours saved compared to asking your own staff to do it. It’s all about making things go as smoothly as possible and hopefully, if you follow these simple tips you will have a stress-free move to your new premises.